Show Affection - Be affectionate and loving towards your pitbull puppy from day one. Pet, play with, caress, and dote on your pitbull friend. Puppies and young dogs that are loved and nurtured seldom grow into violent, mean, or ill-tempered dogs. It's better to have a spoiled pitbull than a vicious one! Socialize your Dog - Dogs that are socialized early, around other dogs as well as humans, typically mature into friendlier, better behaved, less skittish adult dogs. 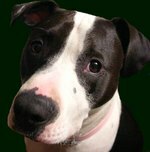 Socialize your pitbull puppy as often as possible with other dogs and people. As your pitbull grows, continue the socialization process, but avoid contacts with mean, ill-tempered animals. Establish Dominance - Your pitbull puppy has to know that you are the boss at all times. Establish your dominance early; correct your pitbull when he misbehaves, guide his behavior with gentle but firm guidance, and use your voice with authority to get your dog's attention. Never abuse or mistreat your dog, but control your dog at all times. Establish your dominant role very early! Never Chain your Dog - Keep your pitbull in a well-fenced area or inside the house when you are away, but never chain or tie your dog up. This can lead to major frustrations and anxieties on your pitbull's part, behaviors that can increase his propensity towards vicious or unruly behaviors. Walk Your Dog Regularly - Take your pitbull for regular walks around the neighborhood. Doing so will give him much needed exercise, familiarize him with being outside and around other people and dogs, and help to reduce frustration and anxiety that can occur as the result of inactivity. Allow Normal Dog Behavior - Certain behaviors such as barking at strangers and investigating strange sounds and/or situations are normal. Never reprimand your pitbull for these normal and expected behaviors. Your pitbull should be alert, vigilant, and territorial, but not vicious. There is a huge difference! Can I Do Schutzhund Dog Training Myself?